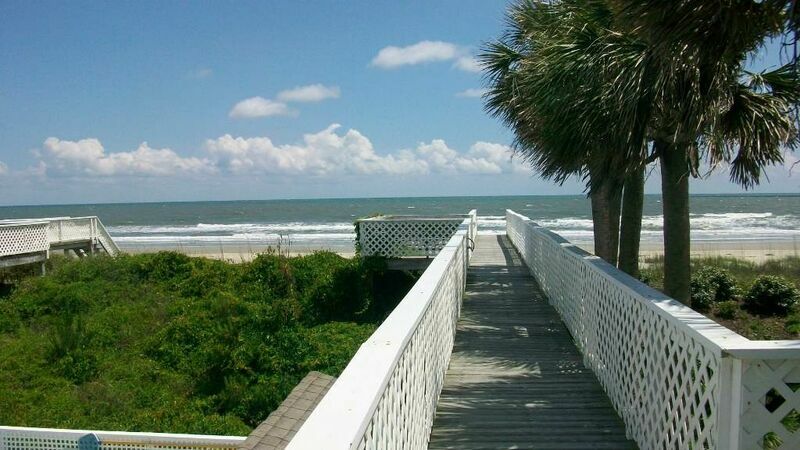 Very well maintained and loved duplex with shared oceanfront pool. Beautifully decorated 7 Bedrooms and 5 Bath property has everything you need for a well-equipped family vacation. Large flat panel TV in the living room with DVD player, televisions in most bedrooms, fully equipped kitchen with dishwasher, microwave, blender, coffee maker, and enough pots and pans to make plenty of family meals. Washer and Dryer located conveniently off the kitchen. Expansive covered porch and sundecks to enjoy the beautiful oceanfront views! Private walkway to the white sand beaches, and charcoal grill provided. Wireless internet is provided in this home. Non-smoking, no pets. All bed and bath linens will be provided as a part of the rental. This property sleeps 14 comfortably in the following bedding configuration. Upstairs: King, Queen, Queen, Queen. Downstairs: King, Queen, 2 Singles. We rented both sides of this house and it worked out perfectly. Everyone had their own space but could also come together through the passage way between the decks which can be closed when you arent renting both sides. It was well cleaned upon our arrival and the few minor issues we had were resolved immediately We loved not having to cart all our linens and towels since they were provided. I could say that the kitchen could have used a few more things a frying pan but it wasnt anything that was a deal breaker. If you can get both sides, book it immediately. We waited 2 hours because schools are starting earlier for us next year and when we called back, the one side was already rented so we were unable to book again . This is a clean property and a great value too. These rentals are so used up by the time August comes, that it was nice to find it in such good shape.